Things can get boring pretty fast if you only have a punching bag to throw some punches at. A sparring mate could be a viable option, but if you're still a beginner then things could get dirty (and painful) fast. For times like these, it sure would be helpful to have a punching robot around to help you land your punches, a punching robot in the form of the Punching Pro. It's not the fastest machine on the planet and that's because it was made that way. Punching Pro comes with several customizable settings that you can toggle to fit your needs. If you want it to throw punches faster then by all means, set it that way. But don't say we didn't warn you. 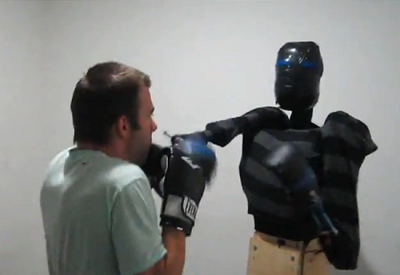 The Punching Pro is an invention by Kris Tressider with the goal of improving the user's punching power and accuracy. That said, it's not exactly a robot that's programmed to hit you back with some accurate shots so you don't need to worry about any retribution here. To give you more motivation to send power punches, just cut out a photo of your worst enemy and stick it right to the Punching Pro's face. That should get the strength of your punches at least 50%.